If you're considering forcing your summer dresses to take the annual walk of shame into the depths of your wardrobe right about now, think again. Last season's offering of midis and maxis ain't going anywhere for autumn, and we bet that at London Fashion Week (which kicks off next Thursday), we'll be seeing plenty of upcycled summer styles. Ultimately it's all about being clever with layers. Whether it's a strategic polo-neck or a throw-on-and-go blazer, it's the easiest way to make your warm-weather frock ready for the colder months ahead. There are also plenty of new-season styles available if you want to freshen up your wardrobe. Ganni's Charron minidress is set to be a winner, for starters. Scroll down to see how our favourite fashion-lovers are styling their dresses for autumn and shop the looks. 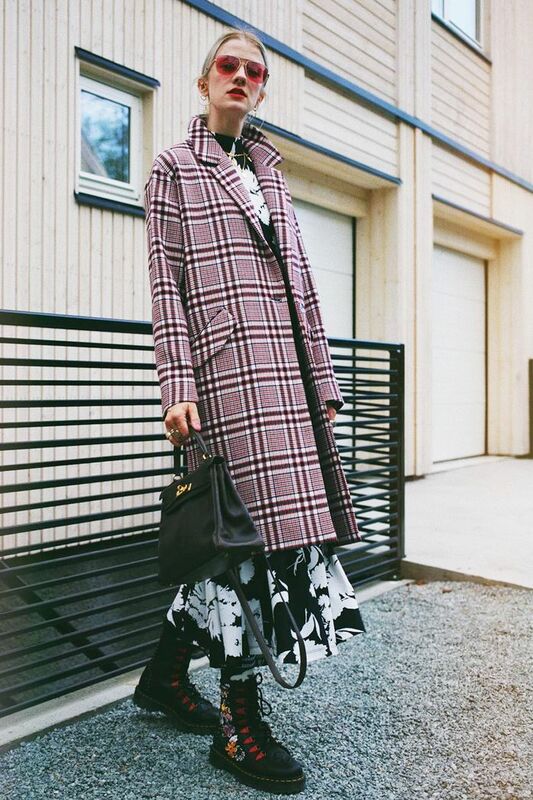 Style Notes: A checked overcoat, a floral dress and Dr. Martens make for the ultimate high/low ensemble. Style Notes: A summer slip dress gets the autumn treatment when rendered in conker brown. Make it work for the colder months by layering a utility shirt underneath. Style Notes: If the head-to-toe brown trend is a bit of a turn-off for you, try pastel pink instead. We love how Nnenna Echem has contrasted her dramatic Stine Goya gown with a smart blazer. Style Notes: Cowboy chic is having a moment this season, and Vens Wife Style shows us how to work the trend without looking like you're going to a costume party. It's all about the subtle Western-inspired accessories.